A brand new urban lifestyle development in an impressive landmark building with unique artistic and architectural features and 36 exclusive apartments located in the very centre of Estepona right on the beachfront and within walking distance of all amenities. The development offers bright, contemporary luxury homes designed for privileged beachfront living all year round. All of the apartments include a fully equipped kitchen and a private terrace where you can enjoy the enviable local climate. There are 1-4 bedroom properties to choose from. The bedrooms feature wooden flooring while the other spaces have porcelain floor tiles with underfloor heating. All of the properties in this development have a storage room and garage parking space, or 2 spaces in the case of the large apartments. Furthermore, there is a communal infinity pool and jacuzzi on the roof top, as well as a gym; offering the feeling of being on holiday all year round with very low community costs (from 150€/month – 200€/month). Completion due in October 2019. 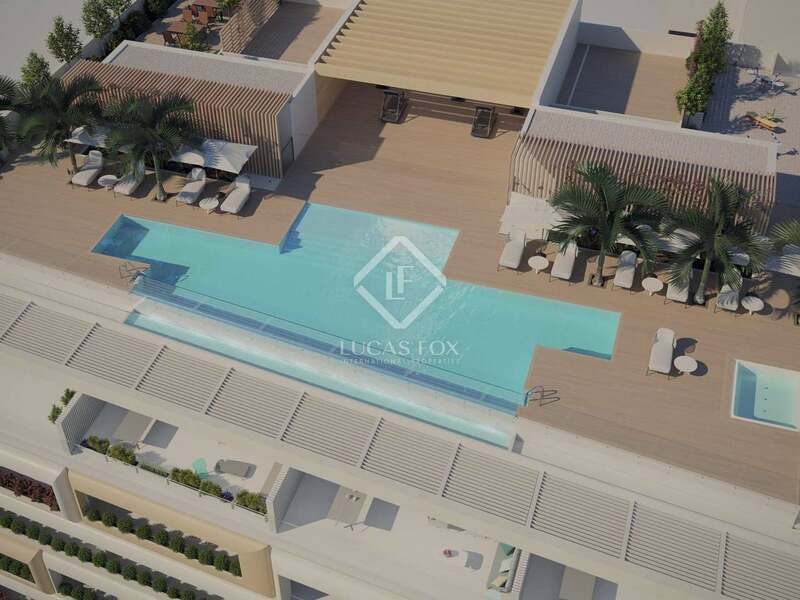 This development is located on the seafront in the centre of Estepona, offering a variety of restaurants, art and culture venues nearby as well as golf courses and beautiful nature spots.